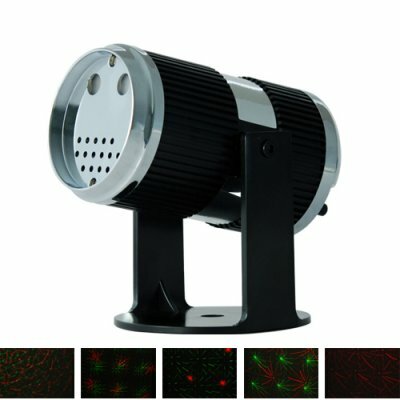 Successfully Added Red and Green Laser Effects Projector with Sound Activation to your Shopping Cart. Let your music activate this really cool laser projector gadget. Perfect to use anywhere in your home, pub, bar and even your retail shop. Project visually stunning patterns and improve your business at the same time. If you're searching for a simple laser projector in order create an ambient atmosphere to your surroundings, then this cool double laser gadget with sound activation feature is what you're looking for. Designed in a compact form factor, and emitting a single Green and Red laser beam that intertwine together in random motion to present stunning visual effects. To operate this simple laser gadget. First, you simply decide were you want to mount the laser projector. Then, you plug it into a wall power outlet, that's it. As simple as A, B, C. This Red and Green Laser Effects Projector presents the user with two optional modes, of which consist the projection of the laser in a slow motion display and an increase of speed, to increase the speed of the projected patterns, just adjust the dial located at the rear of the G173. This laser color changing projector is perfect for any partying environment. You can mount the projector anywhere that suits your needs and it is adjustable to easily be aimed at the area you wish to highlight be it ceiling, floor or wall. Dial effects for auto control. Does the CVGF-G173 comes with a remote control? The laser projector can only be controlled with a dial switch located at the back. The laser starry effects project can reach up to 20+ meters. Photos and Graphics By: F.Y. I really liked the product, the really nice to make a joke .... very resistant material. on 2009-12-30 13:41:59 SIMPLY BRILLIANT! Unbelievable value! Super fast DHL delivery. Could not be more happy!